Over time, all devices start to show problems. Be it due to their aging hardware or faulty software, bugs start to pop up and you start to experience problems with battery life and performance, among other things. Thankfully, if you have an Android device, there are quite a few ways to remove these bugs or at least lessen their effects. Of course, one cannot completely reverse the bugs that occur naturally after some time, but many are fixable with some tweaks to the software. 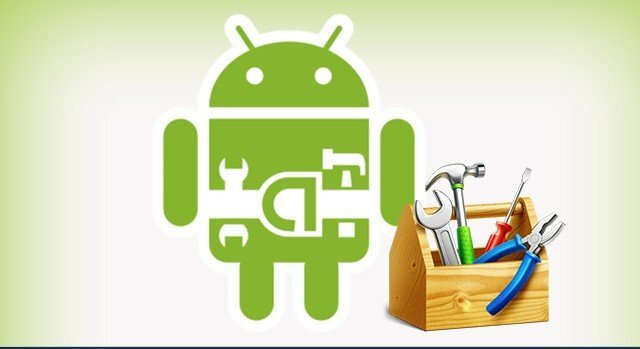 Android has a robust developer community that has tinkered with every part of the operating system, due to which there are several programs that together form a complete toolkit for troubleshooting your Android device. It is a part of the Android Development Kit, and thanks to an XDA developer, you no longer need to download the full kit to get adb. Now what does adb do? Well, adb is a program that, in a nutshell, can send commands to your phone. From pushing files to installing applications and many more helpful commands, adb is extremely helpful to troubleshoot your device. It can reboot your device into recovery mode, and even has a built in logging tool, which may prove to be very helpful for troubleshooting. Fastboot too is a part of the Android SDK, and now is independently available. When your device seems to be bricked, Fastboot just swoops in to save the day, with its array of troubleshooting tools. Fastboot can help flash a new recovery and other images. You can unlock your bootloader, and Fastboot has quite a few commands that can help revive your device. TWRP (http://www.twrp.me) is a custom recovery that replaces your stock recovery. Just press the correct button combination for your device (usually volume buttons + power button) and the device should reboot into recovery mode. TWRP allows you to flash custom ROMs, root your device, backup, wipe and restore your device, and is one of the most important tools to have if you feel like you have soft-bricked your device. Just keep Log Collector running in the background, and it will log everything your phone does. Why would you want a running account of every event that happens on your phone? Well, when something like a force-close or a glitch occurs, you can scroll back to that exact event, and you can find exactly what went wrong. You can then proceed to fix the problem, and as you can see, logging makes this very easy. A staple of a tinkerer’s toolkit for the ages, Titanium Backup is a godsend for those who regularly flash ROMs or are just trying to be safe. As the name says, it can back up every app and even remember individual app preferences. It is more reliable than TWRP for Apps, and has a lot of other important features, like the ability to uninstall system apps, freeze certain apps and more. You can clear up your storage, or make your apps faster with Titanium Backup. It is truly a must-have for your troubleshooting toolkit. As software evolves, it requires more resources, which is why older devices aren’t able to cope. But there’s still one trick up our sleeve: Overclocking, which can help us to get rid of the limit set by the manufacturer and let our device run unfettered. However, you must make sure to not push your old hardware too much, otherwise you may damage it. Alternatively, if your device is fast enough, you can underclock to get more battery life out of it. And this can be done using SetCPU. Download from http://www.setcpu.com/. ElementalX (http://elementalx.org) is a custom kernel for your device, using which you can customize every aspect of your CPU, from clock speed to voltage. Undervolt, overvolt or overclock, you are sure to get the perfect mix of battery life and performance you always wanted. As devices get older, batteries degrade, but you can still salvage some life out of them by tweaking some things and getting a kernel with an efficient governor. Okay, so this isn’t really an app, but a built in feature of most Android devices. By pressing and holding the Power Off option that pops up when you press the Power Button, you can boot into safe mode, where only system apps are present and all the apps you installed don’t run. Well, sometimes one or more apps may run amok, destroying your performance and battery life. This helps you know whether the problems you are facing are hardware based or due to a fault in the apps you installed. When you are experiencing unnecessary wakelocks, i.e your device is not able to sleep properly, leading to battery drain, you need Ap Ops, which lets you control what permissions an app can access. You can turn off location and the ‘keep awake’ option for apps that don’t need them, and you will immediately see a massive improvement in battery life. The stock Android Battery Monitor isn’t going to help you much to troubleshoot battery issues. GSAM is a comprehensive battery monitor that can help you find out what exactly is draining your battery life. Developers have made comprehensive toolkits for popular devices. These toolkits are to be installed on your PC, and let you do just about everything under the sun, from unlocking to rooting to restoring your device to stock. For example, there’s the Wugs toolkit (http://www.wugfresh.com/nrt/) for Nexus devices. You can search for your device to find a toolkit that may just be the solution to your woes. A drawback of LCD Screens, a few pixels on your phone’s display may not turn on as they are supposed to, which can be annoying. Thankfully, there’s a solution, but it isn’t guaranteed to work: Dead Pixel Detect and Fix. It basically flashes lots of colors at once, that may just revive the dead pixels.